Scholastic Honors: Honor Roll Student, Chorale, Symphonic Band, lettered in band for two years, lettered in track one year. Received “one” rating with flute solo and flute ensemble. Leadership Roles: A cheerleader and flag captain. Serves as mentor for the younger candy stripers. 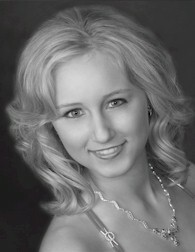 Teaches girls flag routines and cheers in flag and cheerleading clinics. Assists flag sponsor in making flag routines for the Dance Extravaganza fundraiser. Accomplishments: Has served as a volunteer with over 175 hours as a candy striper at local hospital. Is working to bring SADD Chapter into school. Interesting Facts: With her brother, made the decision to move to a 6A school from a small 1A school her freshman year to obtain more opportunities with their education and her music. Employment: Babysitting for family and office work for her father’s business. 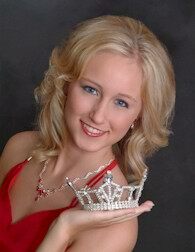 Legacy: During her year of service as Miss Teen Kansas, Erica will work to instill moral responsibility and promote the well-being of a generation that will take a stand against people driving under the influence of alcohol. This can be measured by the decrease of DUI’s and alcohol related accidents. Erica will continue her involvement in the local SADD organization and become involved with the state organization. She will work to make a statement not to drink and drive.